The Microchip (MC) consists of a saturable absorber mirror bonded with a Nd:YVO4 laser crystal. The MC can be used to generate laser pulses at 1064 nm wavelength if pumped with a diode laser at 808 nm using passively Q-switching. The evaluation kit PSFL1030 allows the realization of different picosecond fiber laser configurations using a saturable absorber mirror (SAM) for passively mode-locking. The user gets the needed knowledge to construct its own ps laser setup. 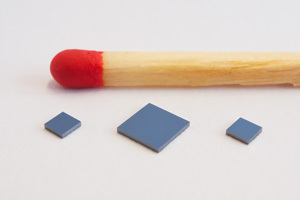 If very small mirrors or long pass filters with dimensions of only a few millimeters are needed then such devices on single crystalline GaAs substrates can be used. Single crystalline GaAs has a good thermal conductivity of 55 W/(m*K) and can be cutted into small rectangular chips because of its cubic crystal structure.